There's also a big update, and a couple of new trailers. 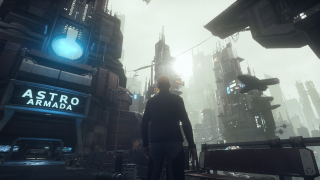 Update: In a follow-up post, Cloud Imperium Games boss Chris Roberts clarified that Lumberyard and StarEngine, the heavily-modified version of the CryEngine that powers Star Citizen, are "forks from exactly the same build of CryEngine." Both CIG and Amazon stopped taking new builds of the engine from Crytek near the end of 2015, and so all that's really changed in the transition is that the "foundation" for the engine is now Lumberyard rather than CryEngine. "None of our work was thrown away or modified. We switched the like-for-like parts of the engine from CryEngine to Lumberyard. All of our bespoke work from 64 bit precision, new rendering and planet tech, Item / Entity 2.0, Local Physics Grids, Zone System, Object Containers and so on were unaffected and remain unique to Star Citizen," Roberts wrote. "We made this choice as Amazon's and our focus is aligned in building massively online games that utilize the power of cloud computing to deliver a richer online experience than would be possible with an old fashioned single server architecture (which is what CryNetwork is)." Roberts noted that Crytek "doesn't have the resources to compete" with Amazon's investment into Lumberyard and Amazon Web Services, nor is it focused on network and online elements of the engine in the way that Star Citizen requires. And since CIG isn't taking new builds of the CryEngine anyway, "we decided that Amazon would be the best partner going forward for the future of Star Citizen," Roberts wrote. He also denied that there was anything sneaky about the timing of the announcement, pointing out that the deal with Amazon wasn't finalized until the release of the 2.5 build. They had agreed not to announce it until the release of version 2.6, which was originally targeted for the beginning of December, rather than just prior to Christmas. "We’ve been working with Amazon for more than a year, as we have been looking for a technology leader to partner with for the long term future of Star Citizen and Squadron 42. Lumberyard provides ground breaking technology features for online games, including deep back-end cloud integration on AWS and its social component with Twitch that enables us to easily and instantly connect to millions of global gamers. Because we share a common technical vision, it has been a very smooth and easy transition to Lumberyard. In fact, we are excited to announce that our upcoming 2.6 Alpha release for Star Citizen is running on Lumberyard and AWS."